Why would anyone pack your bike in a BAG when plenty of box options are available. I’d rather spend a bit of time and pack my bike properly for peace of mind… I’ve seen what baggage handlers do!!! 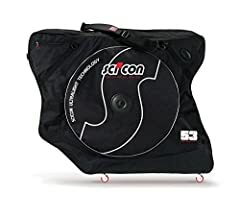 This case will not zip closed over my 63cm bike without removal of the handle bars, seat and post, totally negating the advertised purpose of the bag. The manufacturer says it will fit a 63cm bike but it will not, and they were totally unhelpful when i contacted them.